2016 marks the 10th anniversary of the adoption of the Convention on the Rights of Persons with Disabilities (CRPD). Throughout the past ten years, remarkable progress has been made in advancing the rights of persons with disabilities in society and development. At the 56th session of the General Assembly in 2001, in response to a proposal of President Fox of Mexico, the Assembly established the Ad Hoc committee for “considering proposals for an international convention to uphold the dignity and rights of persons with disabilities” based on experience learnt in the field of social development and human rights. The Convention on the Rights of Persons with Disabilities and its Optional Protocol (A/RES/61/106) was adopted on 13 December 2006 and was opened for signature on 30 March 2007. It is the first comprehensive human rights treaty of the 21st century and is the first human rights convention to be open for signature by regional organizations. The Convention entered into force on 3 May 2008. The Convention is a benchmark document that works to ensure the enjoyment of human rights and fundamental freedoms by persons with disabilities. Together with other international human rights and development instruments, a comprehensive international framework is established to guide national policy-making and legislation, including international cooperation, for building an inclusive society, and fostering disability-inclusive development. At the international level these instruments promote and support disability- inclusive policies and practices. At the national level, they require harmonization of national legislation, policies and programmes in line with these international norms and standards. Ten years on, remarkable progress has seen in the implementation of the Convention and continues to guide and support States in the formulation and enforcement of their legislations, strategies, policies and programmes that promote equality, inclusion and empowerment of persons with disabilities in society and development. The United Nations, together with Member States, Disabled People’s Organisations (DPOs) and other major stakeholders, have also been making efforts to mainstream the rights, needs and perspective of persons with disability in development frameworks at global, regional, national and local levels. Mainstreaming and disability-inclusion are increasingly recognised as an effective strategy and featured in international development frameworks and efforts, such as the 2030 Agenda for Sustainable Development, the Sendai Framework for Disaster Risk Reduction, the World Humanitarian Summit, and the New Urban Agenda. Moving forward, more concrete actions and measures shall and can be taken to further remove barriers, create accessible and enabling environments and conditions and to secure equal opportunities for participation by all persons with disabilities as agents of changes in achieving the 17 Sustainable Development Goals for the future we want for all. • On 13 December 2006, the CRPD and its Optional Protocol, were adopted by resolution 61/106 of the General Assembly. The adoption of the CRPD was hailed as a historic achievement that would bring a hope to billions of persons with disabilities in the 21st century. The CRPD is a comprehensive international treaty of legally bidding nature. 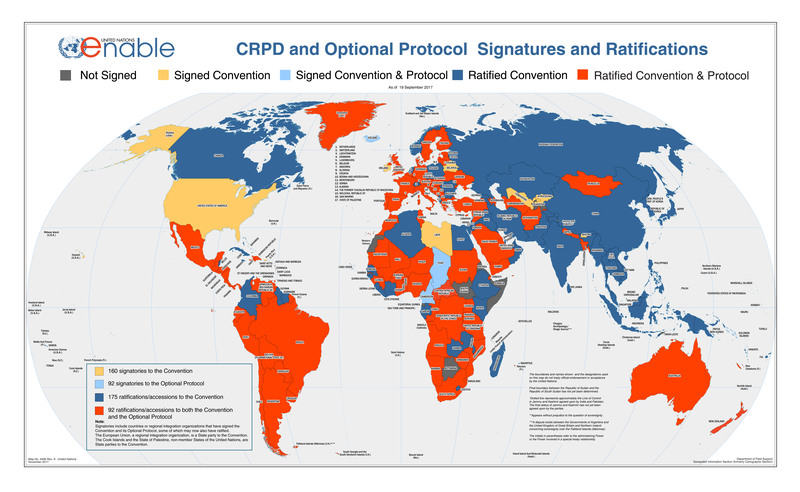 • On 30 March 2007, the CRPD opened for signature and ratification. On 3 May 2008, the CRPD entered into force. • The CRPD has been the most swiftly ratified international treaty. As of 11 November 2016, 168 States and the EU ratified the Convention, representing 87% of Member States in the United Nations. • The Conference of States Parties to the CRPD (“ Conference of States Parties) was established as an international mechanism to consider “any matter with regard to the implementation of the Convention” in accordance with the Article 40 of the CRPD. DESA,(Secretariat for the Convention on the Rights of Persons with Disabilities housed in DSPD as the focal point on disability within the UN system), serves as the secretariat for the annual sessions of the Conference of States Parties to the CRPD. • Since its inception in 2008, nine sessions have been already convened and the Conference of States Parties has grown steadily becoming the largest and most diverse international meeting on disability in the world that is well attended by over 1,000 participants from Governments and a wide range of stakeholders including UN Agencies, non-governmental organisations, including Disabled Persons Organisations, National Human Rights Institutes, academic institutions and development cooperation entities. The Conference of States Parties made a substantive contributions to the global policy discourses, to advance the human rights of persons with disabilities and to promote further inclusive development and inclusion of persons with disabilities in all aspects of society. • The Committee on the Rights of Persons with Disabilities ( “CRPD Committee”) , a body of 18 independent experts elected at the Conference of States Parties every two years, was established in Oct. 2008. The Committee members meet in Geneva three times a year, to consider and review periodical national reports on implementation of the CRPD, produce general comments of relevant provisions of the CRPD, and attend to communications on violations of human rights. The work of the CRPD Committee is mainly supported by the Office of Higher Commission for Human Rights based in Geneva (OHCHR). • In September 2006, the UN Inter-Agency Support Group on the Convention on the Rights of Persons with Disabilities (IASG) was established per a decision by the CEB with a view to strengthen coordination and coherence of the work of UN agencies, funds and programmes and to promote their policies and mechanisms to be inclusive of and accessible to persons with disabilities. The IASG has currently over 30 members who meet periodically, with DESA serves as the co-chair. • On 28 July 2011, the Economic and Social Council (ECOSOC) in its resolution 2011/27 extended the mandate of the Special Rapporteur on Disability of the Commission for Social Development for the period from 2012 to 2014 by requesting the Special Rapporteur to further raise awareness of the CRPD and promote the inclusion of persons with disabilities and the mainstreaming of disability issues in development programmes and strategies at the national, regional and international levels. The Special Rapporteur in his report to the 53rd session of the Commission for Social Development made a specific recommendation towards the Commission to “consider options for establishing a standing mechanism to systematically review and monitor progress in realizing all internationally agreed development goals for persons with disabilities towards and beyond 2015 and to promote coordination, effective implementation and synergies among United Nations programmes”. • In 2011, the UNDG endorsed a Guidance Note on Integrating the Rights of Persons with Disabilities in UN Programming at the country level for UN country teams which was the result of a joint UNDG/IASG task team established by the UNDG Working Group on Programming Issues. • Also in 2011, the WHO and the World Bank issued a joint World Report on Disability in which it estimated over 1 billion or 15% of individuals of the world population live with one or more types of disabilities. • In September 2013, the General Assembly convened the High-Level meeting on Disability and Development (2013) the first ever at the level of Heads of State and Governments in the history of the United Nations. The High Level meeting adopted an Outcome Document that commits to achieving the MDGs and all internationally agreed development goals for persons with disabilities, as well as to mainstream disability in all development efforts. • On 19 December 2013, the Secretary General appointed Mr. Lenin Voltaire Moreno former vice president of Ecuador as his Special Envoy on Disability and Accessibility. • On 1 December 2014, Ms. Catalina Devandas Aguilar ( Costa Rica) became the Special Rapporteur on the Rights of Persons with Disabilities established by the Human Rights Council. • On 18 December 2014, the General Assembly in its resolution 69/142 requested the Secretary General, in coordination with all relevant United Nations entities, to prepare and submit to the Assembly in 2018 a Flagship Report on disability and development reflecting progress made in addressing the relevant internationally agreed development goals and the provisions of the CRPD. • In September 2015, the 2030 Agenda for Sustainable Development a set of new global development goals that promises leave no one behind and specifically include disability and persons with disabilities as cross cutting issues, under five goals in seven targets. • 2015-2016. Disability and persons with disabilities perspectives and issues have been increasingly appreciated as a cross cutting issue and are also referenced in a number of major global development frameworks such as the Sendai Framework on Disaster Risk Reduction (2015-2030) and the Addis Ababa Action Agenda on financing for development as well as in the New Urban Agenda.